Superfluous office space is being repurposed for it. Large floor areas are being broken up to cater for it. Edgy spaces like factories and lofts are perfect for it. So, what is it, Coworking? It's using an office or other working environment by those self-employed or those working for different employers, typically to share equipment and costs, to be part a productive, work- oriented "zone", to share ideas and to collaborate on projects where possible. It began during harder economic times when people started to go out on their own after being made redundant. Businesses started to hire them on a contract basis to cut staff costs and create efficiencies. How long's it been around? Mostly informally when people banded together to share office space. could create a more office/corporate feel and be much more productive. What are the advantages of sharing office space? meeting spaces and boardrooms are all shared by the whole group. Desks can be rented sometimes on a daily basis, but more often on a monthly or 6 monthly arrangement. That's an enormous leg-up for sole business owners, not to have to put out too much cash. Usually coworking spaces allow you to work when you want, with many having 24/7 access. If you need to stay late or start early, then it's an ideal situation. Weekends? No problem. In saying that, it's best to be there when most others are. That's the whole point: to share space, exchange ideas, socialise and focus alongside other workers. Coworking can be fantastic for building a network of business contacts, both within your industry and across others. Building valuable business contacts is how it all works, so it's the perfect environment for that. having similar motivation and mindsets. So the chance to collaborate on a project is often there for the taking. 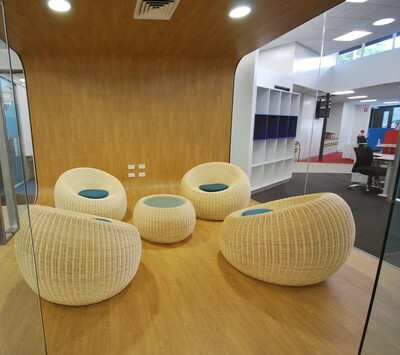 The key is to keep a coworking fitout interesting, energetic and inviting.